It is Tuesday 7/10, a rare week day off for me and I am itching badly to get out and hike to some waterfalls. It is the first day in nearly 2 weeks that the temperatures are not forecast to be near 100, but this comes with a price….50% chance of storms. Me, being a gambling man says go for it, I am not afraid of a little shower. 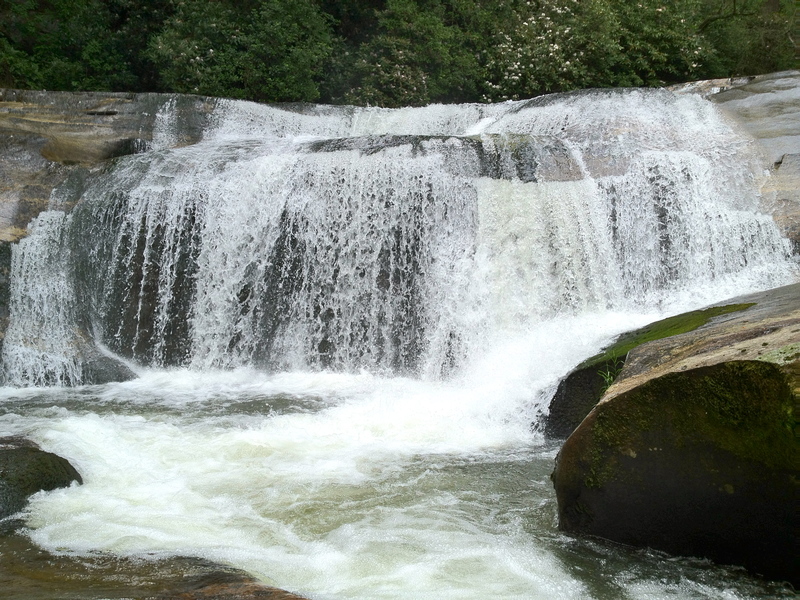 I have a perfect hike planned in the Wilson Creek Wilderness that includes 3 waterfalls that I have never laid eyes on. I am excited. Then, after driving 80 miles to Morganton NC, the bottom drops out, not a small shower but intense thunderstorm with blinding rains. This is a problem, so I stop, have breakfast and review the trusty iPhone weather maps and forecast. A very large, expansive line of storms was over my destination that did not break until middle Tennessee. This means this area was in for a lot of rain for a considerable amount of time. Me, not ready to accept defeat, did notice that the area of NC southwest of Asheville was all dry. Heck, I was this far, I will just change destination and have a great hike somewhere else. Brevard is the town where my new destination was. 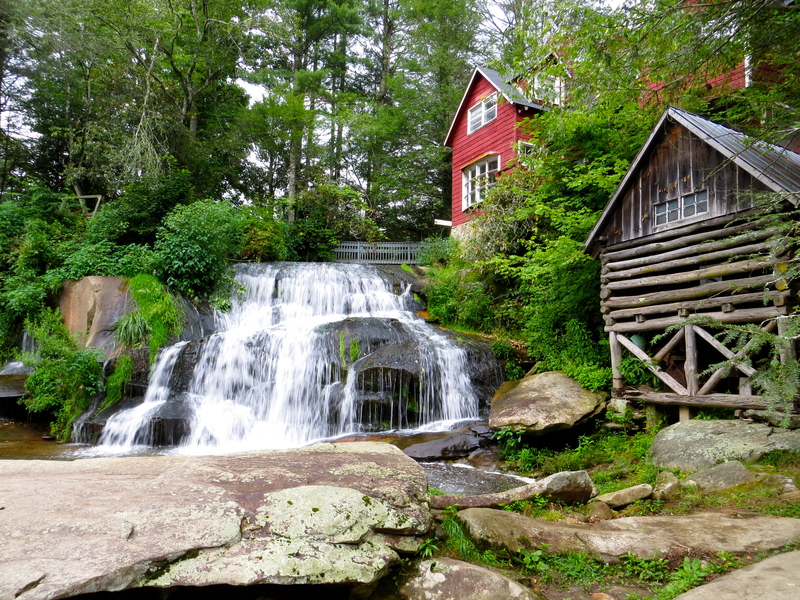 This is a town surrounded by crazy waterfalls and mountainous attractions. What became a 50 mile loop on this day started at the intersection in Brevard of HWYs US 64, US 276, and NC 280. Once here, guess what followed me? New developing thunderstorms. What was once dry was now dark, loud, and very wet. At this point I decided that I drove this far, so I am going to see at least 1 waterfall. 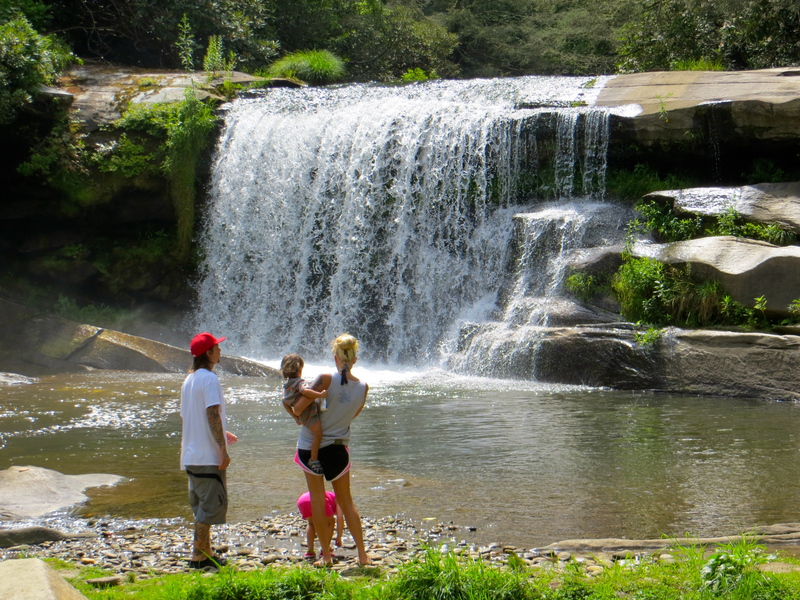 Luckily, taking US 276 north for about 7 miles brings you to one of the finest waterfalls in NC, a roadside beauty called Looking Glass Falls. The storm broke briefly and I was able to walk down to the base only to find nearly 100 kids waiting to swim. The water was very high, the thunder was very loud, and there were a lot of stupid kids swimming in this dangerously swollen creek in these conditions. For me though, it made for a good picture :). Notice the idiot under the falls….this water was high and getting higher!! After this, I was not sure what was next, but there were so many cars trying to park, I could not turn around, so I kept going up US 276, up a steep mountain. There are many things to do on this stretch of highway. 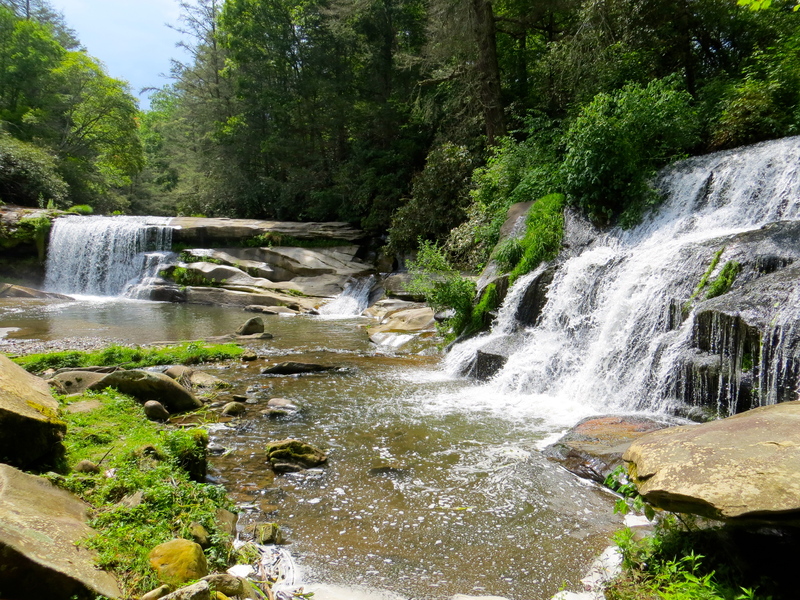 I only stopped for Looking Glass Falls, but there are numerous hiking trails to other waterfalls including Moore Cove Falls (nice waterfall, fairly short hike), Twin Falls, Cove Creek Falls, Jackson Falls, and Catheys Creek Falls. 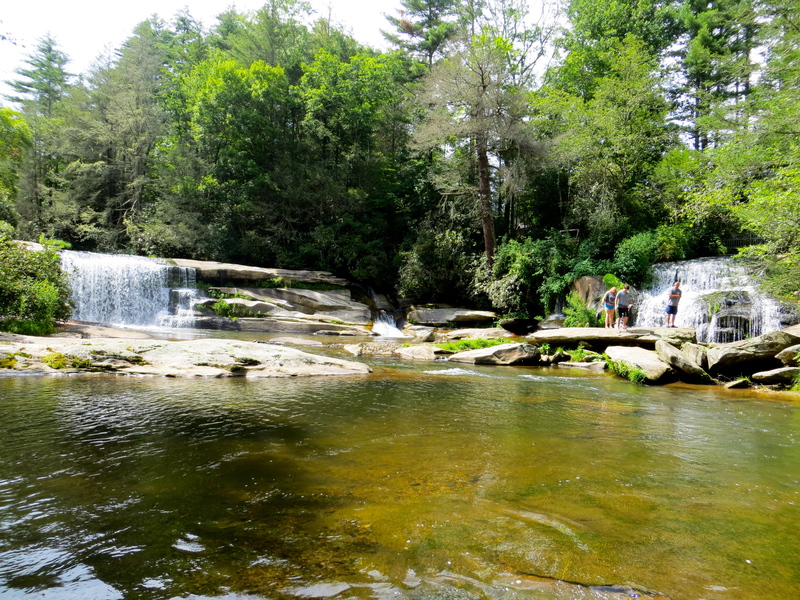 I have only hiked to Moore Cove Falls, but not on this day. 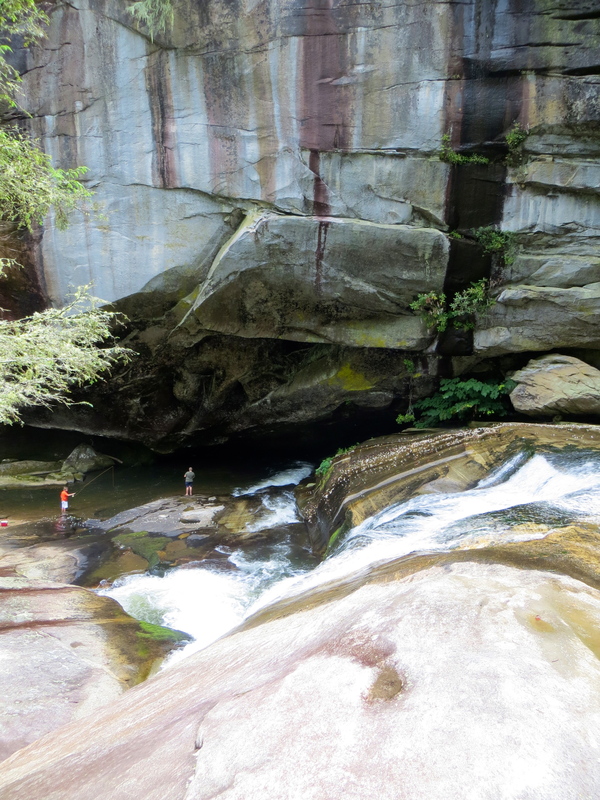 There is also the favorite of many…Sliding Rock, here as well, where folks slide on their tushis down a 60 foot rock, not on this day though. 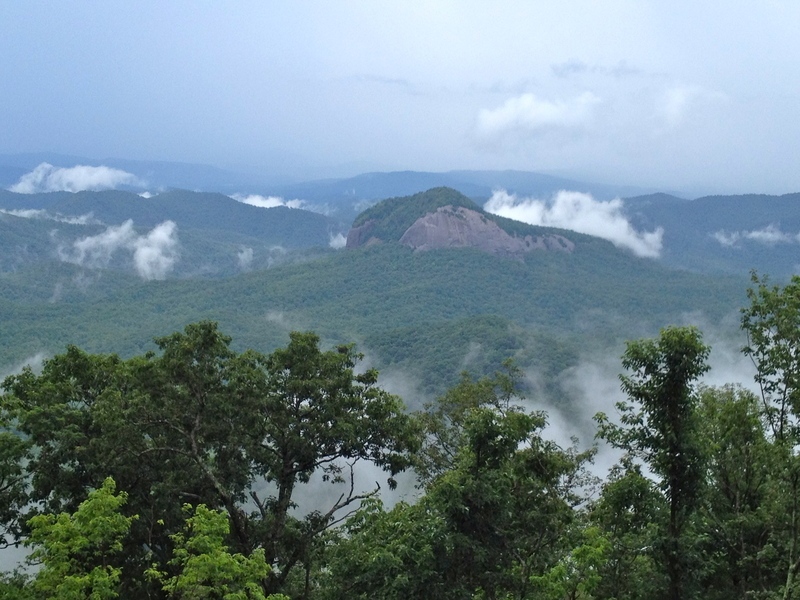 The trails to Looking Glass Rock, Pink Beds Trail and the Cradle of Forestry are all here on this stretch of US 276 between Brevard and the BRP. It is quite a 20 mile stretch, that includes a very curvy mountain drive and lots of views of the beautiful Davidson River. Now to the parkway, by now I was slowly outrunning the developing storms but every time I stopped, I could see them coming towards me with a BRP layer of fog moving in ahead of it. Anyone familiar with the famous BRP fog knows what this is and how thick it can be. It did however make for some of the best shots of Looking Glass Rock I have to date. Here Comes The Pea Soup!!! As the storm was catching up with me, it was time to move on. I was heading South along the Blue Ridge Parkway at this point. I wouldn’t be on it very long, but the stretch I did drive is filled with attractions and things to do. At the intersection with US 276, is an overlook of Cold Mountain, which makes beautiful sunsets. 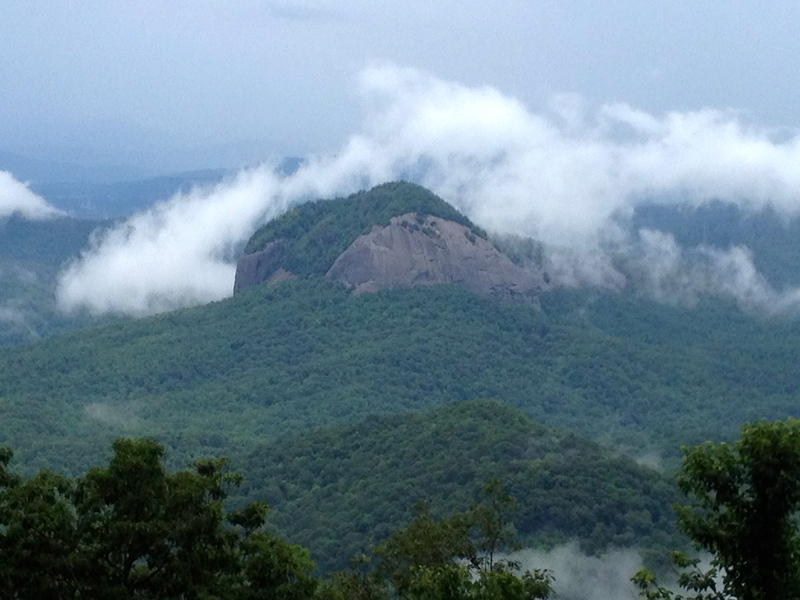 Numerous overlooks of Looking Glass Rock are available here. It is quite an attraction. It is a very popular Rock Climbing destination. It gets its name from the way it look when it gets wet and reflects sunshine. It rises from the valley floor to an elevation of 3969 feet. The trail to hike it has an elevation gain of over 1700 feet which should give an idea of the size of this pluton monolith. From the Looking Glass Rock overlook, there is a trail to Skinny Dip Falls, maybe next time… Shortly down the parkway next, is the hugely famous Graveyard Fields. I have already done a few blogs on this place, it is one of my favorites, with Second Falls, Upper Falls, and Yellowstone Falls. Even with storms all around, the parking lot was jammed packed. People love this place! 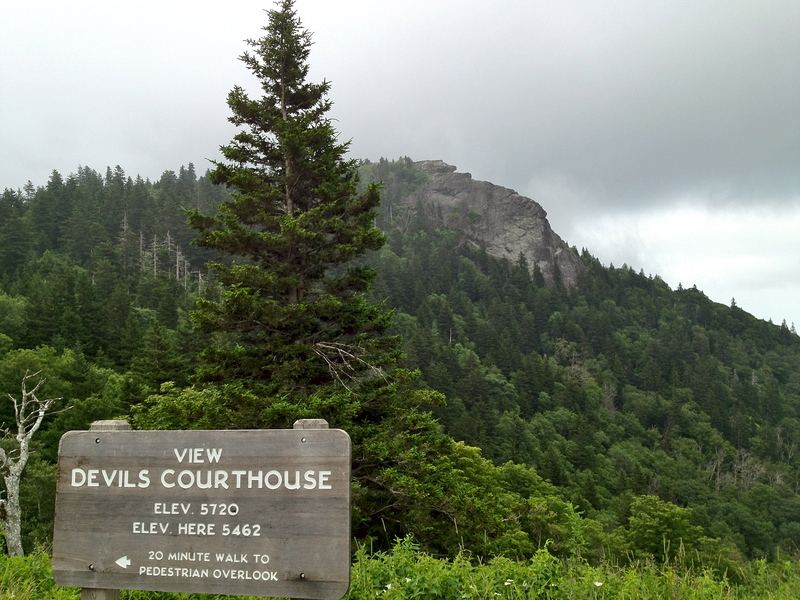 Next comes the Devils Courthouse, another Giant Rock on a mountain top. 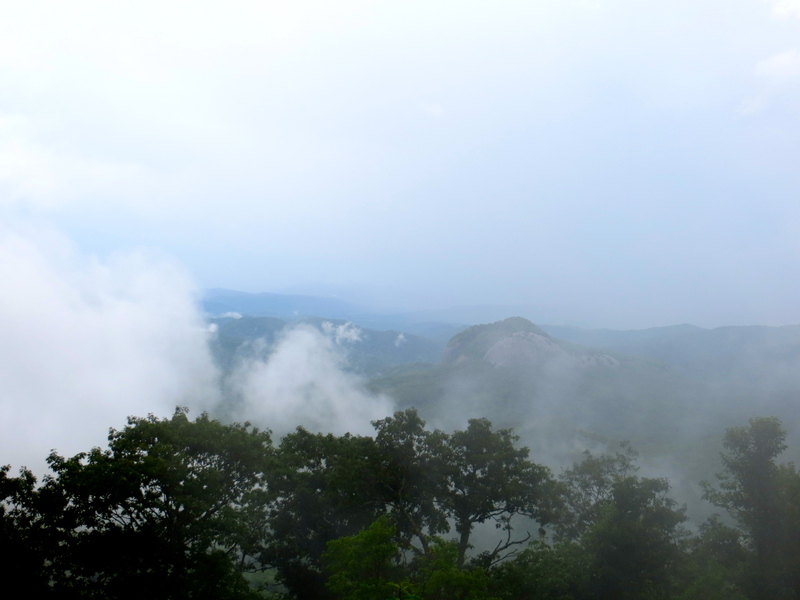 It has a 20 minute trail to the top for an outstanding view, but the fog and storm were right on my tail, so not today! 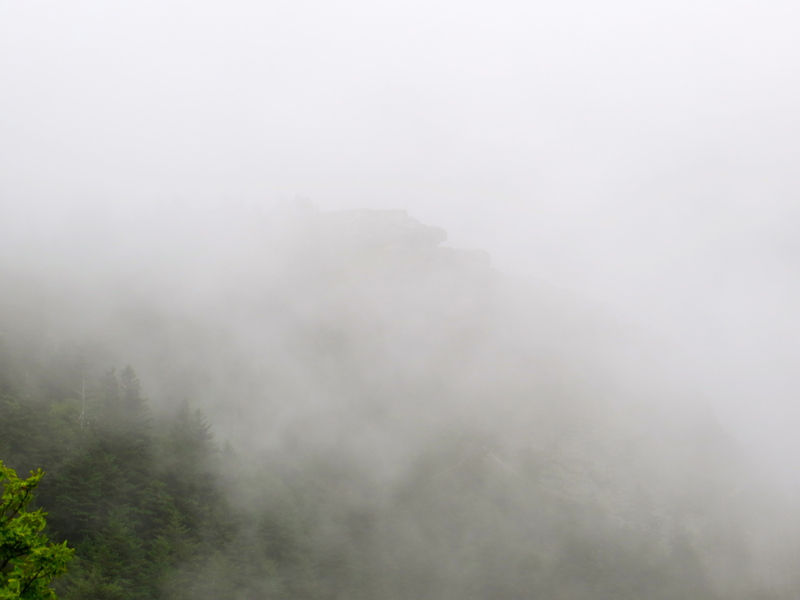 Had time for a few shots of the Devils Courthouse, then I was in the Fog and Thunder again! I soon came upon an intersection with NC 215. I had never previously traveled this road so I looked on the trusty GPS to see where it went. I noticed it reconnected with 64 just west of Brevard. I was getting pretty tired of trying to stay out of the storms, so I decided it was time to take it and turn back toward home. I wasn’t expecting any more attractions, how naive of me. This trip goes down the mountain as US 276 takes you up it (depending on which way you go). Once I got home, I learned that I passed the road to get to Courthouse Falls, a waterfall I have been wanting to see, now a return trip will happen. I did see a waterfall from the highway out of the corner of my eye and stopped to turn around. It was this large religious retreat center called “Living Waters” I pulled in and asked someone if I could walk down to the waterfall and they were very kind and said of course. I had no idea of the beautiful scenery that was about to present itself to me. I had found myself on the North Fork of the French Broad River, at a confluence with Shoal Creek. Both of these bodies of water fall over the same 20 foot rock shelf to form a truly beautiful setting that you have to see it to truly appreciate it. Getting a view of both falls here is challenging. Here I was standing in the middle of the river in water about 1 foot deep. This setting was gorgeous, however there is more. 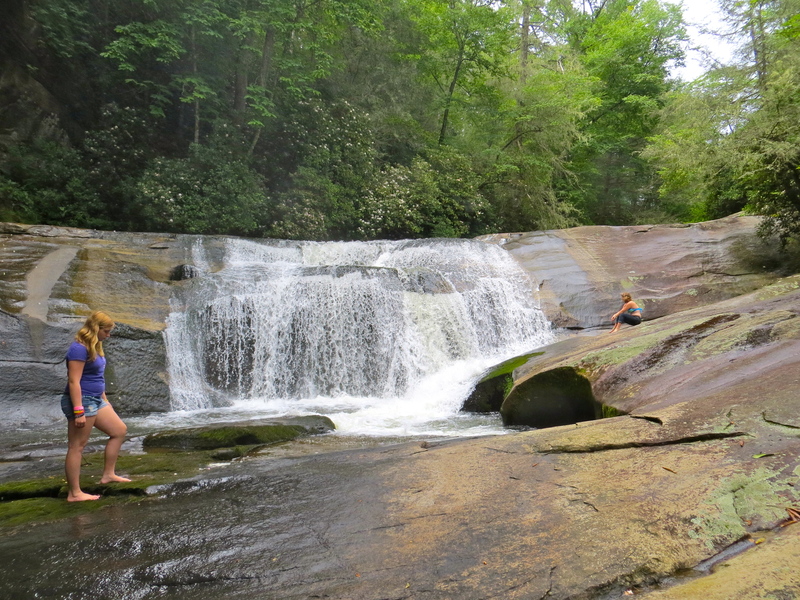 The folks at Living Waters had a trail with some steps and bridges that goes down stream to more cascades and falls. 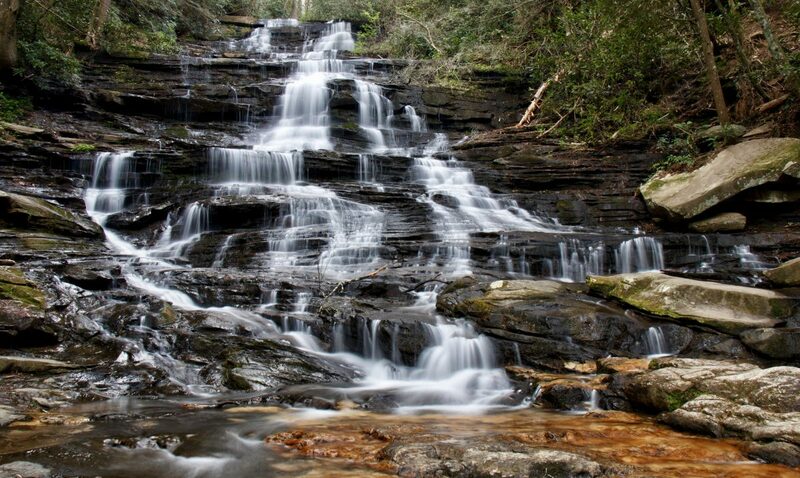 There were 3 cascades that would have names on some creeks but I could find none for these so I will leave them out. At the bottom of the trail is Cathedral Falls. 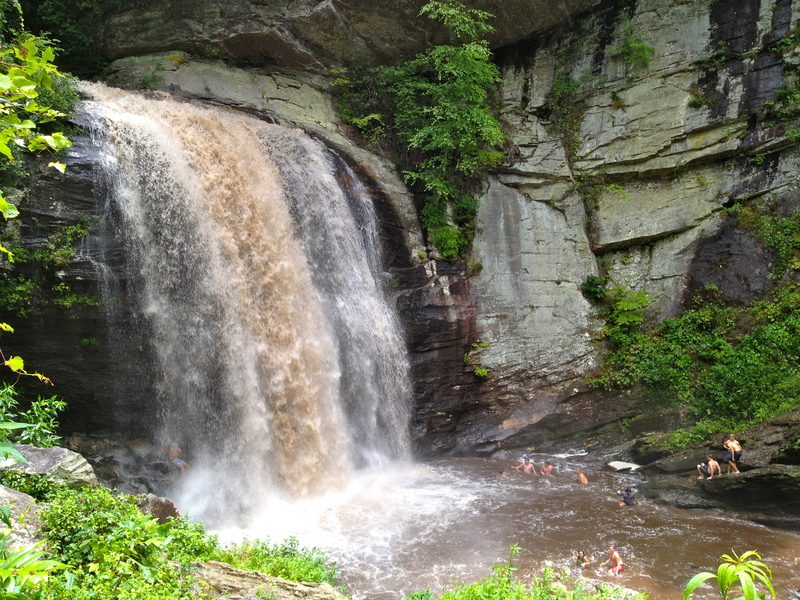 It is a nice 20-25 foot waterfall, but what makes this special is the 150 foot cliff that this waterfall falls into, creating a big pool that rests against the cliff itself. I found some folds fishing down here and even found a good size catfish swimming in a pool in a hole in the rock. It was a difficult waterfall to get a photograph that showed all of the elements here, so I will have to go back and try again…shucks! Watch out, these rocks are slippery! Cathedral Falls, looking down from the top at the pool below at the cliff with a few people fishing in it! After this, it was time to head on home. 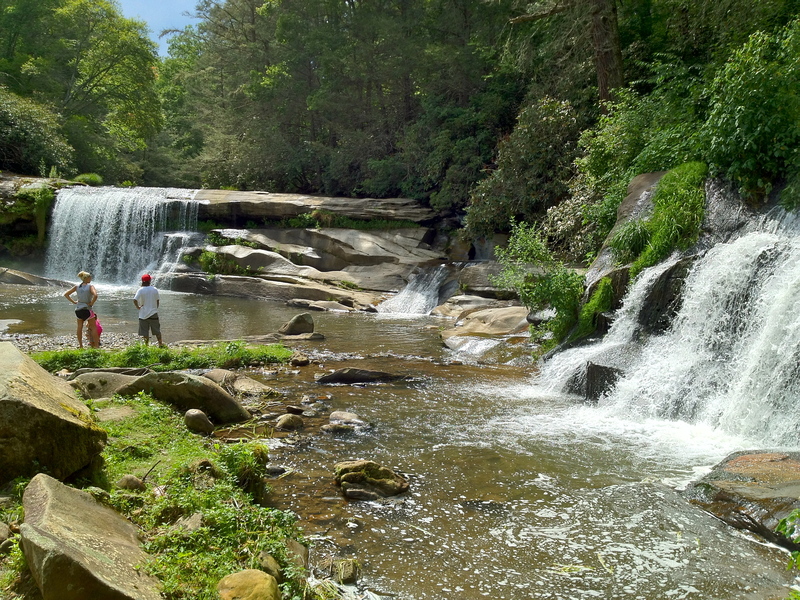 When I got to US 64, there I was right at Toxaway Falls, which means Gorges State Park, Panthertown Valley, and Whitewater Falls were not far away. This is a place one could easily spend a week, it made a great afternoon drive avoiding storms! !